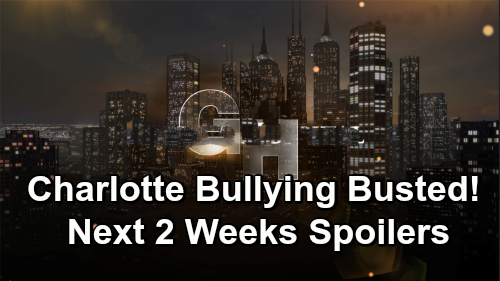 General Hospital (GH) spoilers for the next two weeks tease that Port Charles will remain in mourning. During the week of December 10-14, Ava (Maura West) will be a mess over Kiki’s (Hayley Erin) looming memorial service. She’ll have to tell Avery (Ava and Grace Scarola) that she’ll never see her big sister again, so that’ll add to this mom’s sorrow. Kiki’s funeral will be touching and tearful, but Ava’s outburst will lead to a tense atmosphere. She’ll blast Carly (Laura Wright), who’ll simply be trying to pay her respects. “Kevin” aka Ryan (Jon Lindstrom) will comfort Ava and keep pulling her toward the dark side. However, he’ll also get confronted by Carly later this week. She won’t understand why “Kevin” is practically attached to Ava’s hip. Other General Hospital spoilers say Griffin (Matt Cohen) will struggle to find his footing. He was already envisioning a bright future with Kiki, but now he feels alone and without hope. Griffin will have a hard time letting go and finding a new path to head down. Over with Sonny (Maurice Benard), he’ll have a heartfelt conversation with Oscar (Garren Stitt). They’ll share some nice moments as they talk about Josslyn (Eden McCoy) and the battle Oscar’s facing. Sonny will also get tangled up in a war with Marcus (Nigel Gibbs). Making Mike (Max Gail) back off Yvonne (Janet Hubert) will be easier said than done. The week of December 17-21 will deliver even more GH drama. General Hospital spoilers state that Sam (Kelly Monaco) will deal with growing anxiety. She’ll get support from Jason (Steve Burton), but she’ll worry all over again when a disturbing message arrives. Sam is digging for answers about this Leland Powell obituary, but she should be surprised by where the mystery leads. Daisy (Kelsey Wang) is the key to sorting this mess out, but Kristina (Lexi Ainsworth) will remain blindly devoted to her pal and the DOD cause. It’s clear that major trouble’s brewing! Other General Hospital spoilers state that Elizabeth (Rebecca Herbst) will hit the roof. It looks like Liz will find out Charlotte (Scarlett Fernandez) is to blame for Aiden’s (Jason David) suffering. She’ll want to put a stop to this bad behavior as soon as possible. Meanwhile, Valentin (James Patrick Stuart) will inch closer and closer to the reunion he’s dreaming of. Nina (Michelle Stafford) will find herself falling hard again, so she may not be able to fight it much longer. Unfortunately, Valentin’s fake-daughter scheme could destroy his chance at happiness down the road. Recruiting Sasha (Sofia Mattsson) for his plot is bound to blow up in his face. It sounds like some exciting episodes are ahead in PC. We’ll give you updates as other GH news comes in. Stay tuned to the ABC soap and don’t forget to check CDL often for the latest General Hospital spoilers, updates and news.